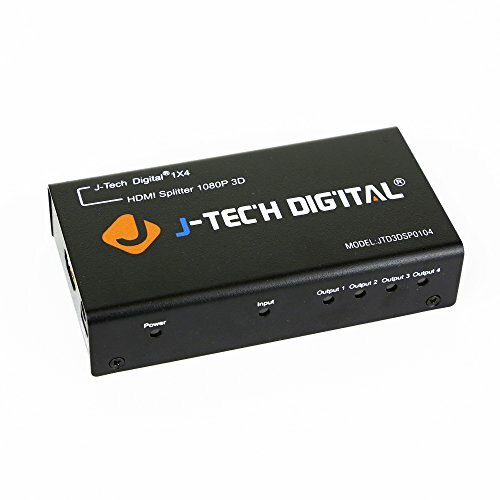 J-Tech Digital (registered US trademark) proudly provides this latest generation HDMI 1x4 splitter, V1.3 Certified with newest Chips & more robust & exclusive Firmware. Best HDMI splitter on the market. - One HDMI signal in and four HDMI signals out. This is true HDMI 1.3 Certified HDMI Splitter; V1.3 signal in, V1.3 signal out. This is not a splitter that is "support/compatible/compliant" to HDMI 1.3. - This is the best HDMI 1x4 on the market offered at this incredible price from J-Tech Digital based on the specifications and the only HDMI 1x4 Splitter with headroom up to 10.2Gbps. - The two outputs are independent; it works even when only one display is working.